My copy of 'Captured Eagles' arrived! What an exciting publication this is! Quite stunning. We've all seen plenty of photographs of German types taken by Allied servicemen as they moved ever deeper into Germany during the last months of the war, but quite simply this new collection is superlative - with the promise of more to come. What distinguishes this book from similar titles is the range, extent and quality of the new images, all but three of which are previously unpublished anywhere. In addition the majority of the images in this Volume 1 are beautifully clear and reproduction is of the highest quality. 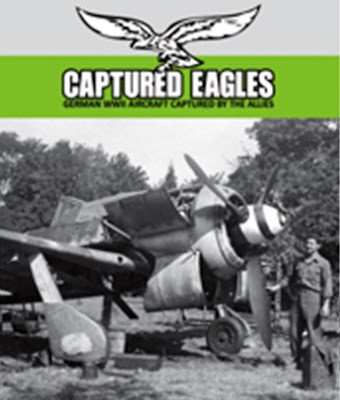 Similar in feel to " LO+ST ", 'Captured Eagles' easily surpasses that volume in terms of quality of image reproduction, image size, page format and layout and of course in terms of the extensive supplementary details presented in the lengthy English-language captions. Between its glossy card covers 'Captured Eagles' features more than 85 previously unpublished photos of captured German aircraft taken by US, British or Australian soldiers during 1944/45 over some 72 large A4 format pages with just three images previously seen. Eight original colour profile artworks were created for this volume by Simon Schatz ( known for his work for Classic Publications among others; 'Dornier Do 335' ´He 162 Spatz´ etc). 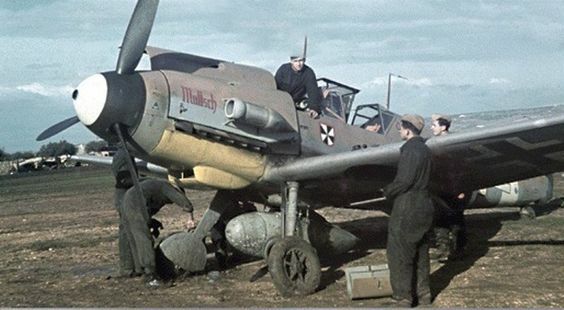 Without wishing to give too much away, various aircraft types are featured such as Bf 109 G/K, Fw 190 A/D, Ju 88 A/G/T, Ju 188, Me 410, Me 262, He 162, Ju 290, He 111, He 219, and more. These are presented in chapters according to mission/type, ie 'reconnaissance', 'destroyer', 'jets', 'mistel' etc. And while there are one or two 'wrecks' most of the aircraft featured here are 'complete' examples. Illustrations of anciliary equipment (control columns, service hatches) and depictions of emblem badges are sprinkled throughout the text. Also featured are log-book extracts and even a personal account or two..
Each photo and caption are numbered to facilitate reading and subsequent further discussion on the author's website (address below) Highlights include a previously unknown Fw 190 D-13 and the first photographic proof that the Ju 88 G-7 actually entered production at the end of the war! One of my particular favourites is a lovely new image of the 7./JG301 Dora 'Yellow 15' which is soooo clear and its caption so detailed that it makes all previous published captions redundant at a stroke! But just about every photo here gets the treatment - well researched, described in detail -some captions five or six paragraphs long- and superbly presented on a single page. No photos across the binding here. 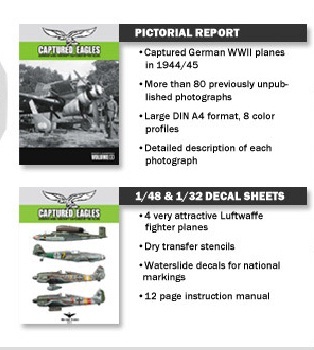 For the modelling fraternity decal sheets for both 1/48 and 1/32 are also available separately in a twelve-page booklet that features four very attractive aircraft illustrated in full colour (1x Bf 109 G-10, 2x Fw 190 A-8, 1x He 162 A). Stencils are provided as dry transfer decals (printed by Hobbydecals) and markings as wet transfer decals (printed by Cartograf). The quality of these exciting sets is further assured by the contributions of noted researcher David E. Brown and the profile artist Simon Schatz. By profession an engineer and currently active as a consultant in the power generation business, Roger Gaemperle has created one of the most professional Luftwaffe photo-album books I have ever seen and he thoroughly deserves to be supported in his exciting new venture. A second book is already in the planning stages with rare photos of a Ju 388 prototype, a JG 300 Bf 109 G-10 with Reichsverteidigung bands and much more. In fact it is no exaggeration to state that you miss this one at your peril!